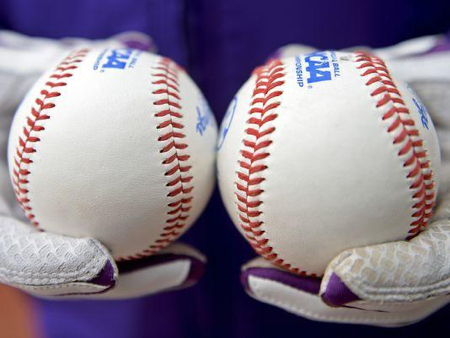 Have Flat-Seam Baseballs Changed College Baseball? After a record-low number of homeruns hit in the 2014 baseball season, the NCAA instituted a major rule change that altered college baseball. 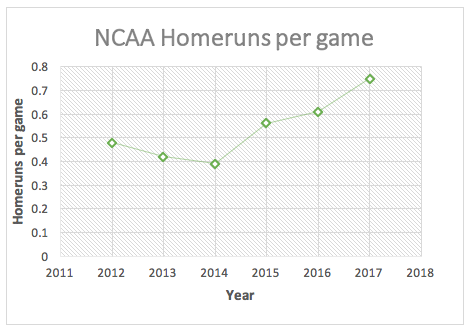 In 2015, the NCAA switched to a new baseball, modeled after a professional baseball and the effects of the change have been sending waves through the game for the past three seasons. The baseballs used before the change were known as high-seamed balls due to the fact they have seams raised off of the baseball. The new baseballs (pictured on the left) are known as flat-seamed balls and the difference can be seen pictured below. A measurable difference between the high-seamed and flat-seamed balls are their coefficients of restitution (COR). COR can be defined as the ratio of final velocity to initial velocity after a collision. The higher the COR the farther a baseball will travel. The high-seamed ball’s COR is 0.555 while the flat-seamed ball’s COR is 0.578. A study from Washington State and Rawlings research lab concluded that a flat-seamed ball with a 95 mph exit velocity at a 25-degree angle travels on average 387 feet. However, a high-seamed ball with the exact same variables only travels 367 feet. This 20-foot variance makes the world of difference in the game of baseball. The seemingly small 0.023 change in the coefficient of restitution of the baseballs led to a major change in college baseball. The 20-foot increase in average distance travelled led to an increase in homeruns hit. In the three years preceding the change in baseballs there were 7,974, 6,902, and 6,446 homeruns hit respectively. That equates to 0.48 homeruns per game in 2012, 0.42 in 2013, and 0.39 in 2014. After the change to flat-seamed baseballs there were nearly 3,000 more homeruns hit that next season in 2015, a total of 10,097 in 2016, and 12,321 in 2017. Such a small change in the COR led to almost double the homeruns in 2017 than 2012. With that being said the homeruns per game jumped to 0.56, 0.61, and 0.75 in 2015-2017 respectively. These percentage jumps are great for baseball. A large increase in homeruns, due to a change in baseballs, has led to changes throughout the sport. It intensifies pressure for recruiting powerful hitters to use flat-seamed baseballs for your team’s advantage. It also changes the game play as more teams have stopped sacrifice bunting and play for the long ball. 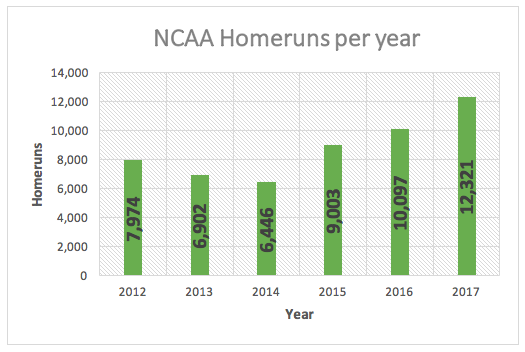 However, with such an enormous increase in homeruns hit following the change in baseballs, I would not be surprised if the NCAA eventually did something to decrease the amount hit again. Although, homeruns are something that makes the game exciting. Players are getting stronger, swings are changing to hit fly balls, and in turn the homerun totals are steadily climbing. With that being said, the excitement and popularity will hopefully increase. If that is the case, the NCAA will just leave it be and college baseball will soar to new levels. This blog post was written by Samford University student Stephen Jones.